Reminders. Music albums. TV shows. Public transit. Books. Video Games. In among the host of other search features unveiled at the Google I/O keynote today, Google announced that six new cards will be coming to its card-based predictive search system, Google Now. Reminders -- like "get milk" -- details for music, TV, books and video games and public transit messages. Google also demonstrated "hot words" in Google voice search, allowing potentially ambiguous queries such as "show me my photos from New York" or "when does my flight leave" to produce accurate results based on the information at Google's disposal. The demo ran remarkably smoothly and quickly, and with seemingly perfect accuracy. 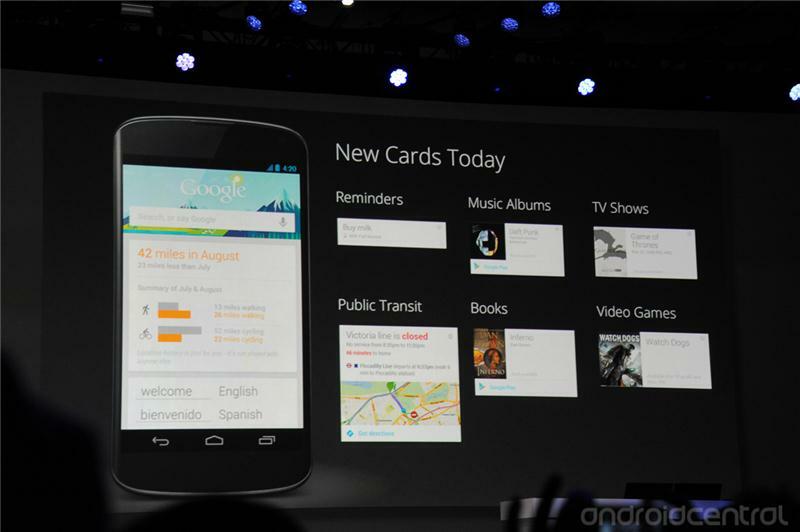 The new Google Now cards will begin rolling out from today. Remember we're still liveblogging the I/O keynote, so head over there to see everything as it happens.